Ireland’s oldest festival will kick off the festival season on Saturday in spectacular fashion. 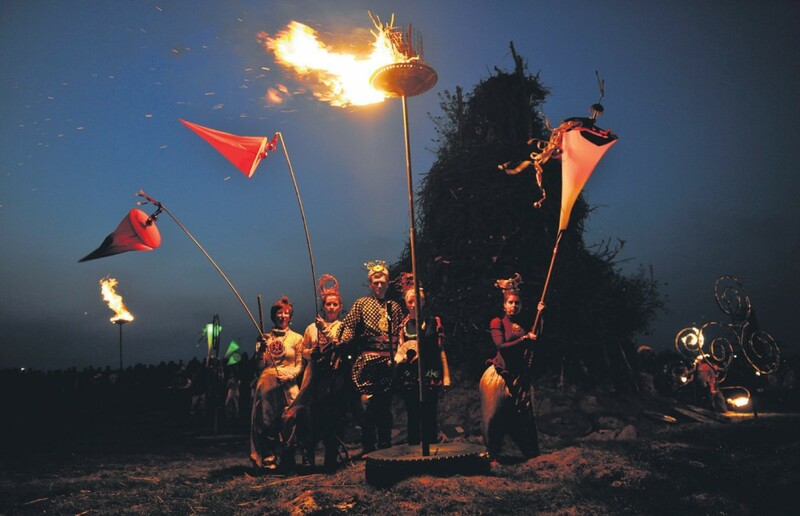 Festival of the Fires, a rekindling of the ancient Celtic Bealtaine festival at the Hill of Uisneachin Mullingar, County Westmeath, is set to attract 5,000 revellers to the very centre of Ireland for a mix of music, fire performance, art, culture, heritage and pageantry. The festival culminates with the ignition of a massive signal bonfire on Uisneach which is the catalyst for fires to be lit on over 100 hills visible from the summit. It is preceded by an illuminated night-time fire parade which has been likened to a night-time St Partick’s Day parade. Over 90 musical acts will take to the festival’s seven stages on Saturday as well as thousands of artists, historical re-enactment groups, Uisneach Warriors on horseback, fire performers, poets, painters, healers, shamans, story-tellers, druids, fire artists, sculptors, carvers and craftspeople, music makers and shakers. It has become the official festival of RTE’s hit TV show ‘The Voice’ with the main stage headlined by Bressie, playing his biggest ever solo gig in his hometown. Joining him on the main stage will be Pat Byrne, playing his first solo gig since winning ‘The Voice’ . The man Pat knocked out, bookies favourite Conor Quinn, will also be performing his first major solo show, showcasing new material he has written with Bressie. The ex-Blizzards front-man has also promised some very special guests. Also playing the award-winning event are Donal Lunny, Kíla, Hothouse Flowers, Kilfenora Ceili Band, Jape, Hawkwind, The Riptide Movement, Jerry Fish, Relish, The Pale, Paddy Cullivan, The Aftermath and Maria Doyle Kennedy. Full stage times are up in the MUSIC section. Other times in the schedule section and please see FAQ for all other questions. Met-Eireann are predicting sun shine all day, whilst Astronomy Ireland say a once-in-a-lifetime meteor shower will be clearest ath the festival site on Saturday night through Sunday morning – and that at their brightest peak, meteors may be seen every three minutes, up to 20 times per hour. There is also a ‘super moon’ – the biggest and brightest full moon of the year, especially for Bealtaine! The stars are aligned, a super moon is primed and the sun is promised to shine and organisers’ music impresario Paddy Dunning, writer Ronan Casey, and cattle breeder David Clarke can certainly guarantee a good time. “There is no festival like it in the world,” says Dunning. “When the fires are lit at 9pm, and all the stages close for the parade you will be transported back to ancient times.” He says the festival was rekindled in 2009 to allow us get back in touch with nature and to promote the festival site, the sacred Hill of Uisneach. Tickets are on sale from Ticketmaster outlets and on-site at the festival box office from 11am priced €39.50. Children Under 12 go free and pensioners tickets are only €10. It is proudly non VIP event where every festival goer is a participant. This entry was posted on Friday, May 4th, 2012 at 4:16 pm	and is filed under Uncategorized. You can follow any responses to this entry through the RSS 2.0 feed. Both comments and pings are currently closed.